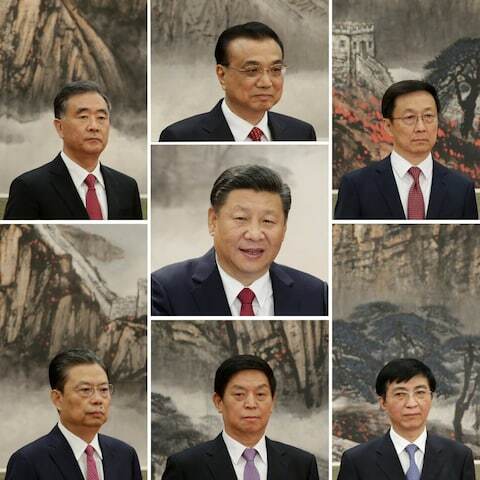 Xi Jinping (center); from top left clockwise: Wang Yang, Li Keqiang, Han Zheng, Wang Huning, Li Zhanshu, Zhao Leji and Wang Yang. The Chinese Communist Party concluded its 19th Congress on October 24, followed a day later by the first meeting of its newly-elected Central Committee, which selected the 25 members of the Politburo, and within the Politburo, the seven members of its Standing Committee, in hierarchical order: Xi Jinping, Li Keqiang, Li Zhanshu, Wang Yang, Wang Huning, Zhao Leji and Han Zheng. Only Xi and Li were members of the previous Standing Committee, the other five are newcomers. Several of them will assume top state functions when the National People’s Congress (NPC) convenes its annual session next March. Li Zhanshu is expected to become Chairman of the NPC – China’s parliament – while Wang Yang would assume the top post in the Chinese People’s Consultative Conference (CPPCC), an advisory body to the NPC. Zhao Leji is heading the Communist Party’s Central Commission for Discipline Inspection (CCDI), China’s primary anti-corruption body. Han Zheng, who is stepping down as Party Secretary of Shanghai, is expected to become Executive Vice Premier next March. Wang Huning is heading the Secretariat of the Central Committee. The Standing Committee Members were presented to the domestic and foreign press following the meeting of the Central Committee. For the first time, all Standing Committee Members were born after the founding of the People’s Republic of China in 1949. They began their political careers around the time of the launch of reform and opening-up in 1978. There is no one in the Standing Committee who would still be young enough to take over from President Xi Jinping in five years’ time. Neither of the two men currently considered most likely to succeed Xi – Hu Chunhua and Chen Min’er – were elevated to the Politburo Standing Committee. At the Politburo level, Yang Jiechi is the first professional diplomat to become a member of the body for 15 years, and is now a front runner to become a Vice Premier. Li Qiang, Party Secretary of Jiangsu province, will take over from Han Zheng as Party Secretary of Shanghai. As expected, the closing session of the Congress voted unanimously to include “Xi Jinping Thought on Socialism with Chinese Characteristics for a New Era” in the Charter of the Communist Party.